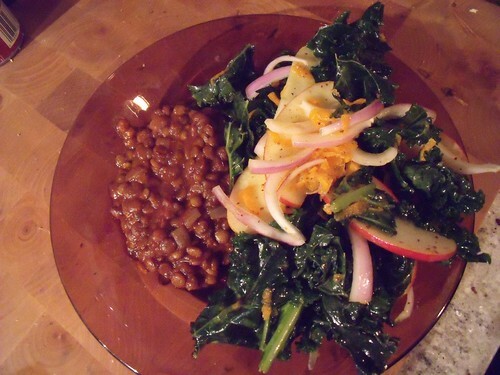 I’ve been seeing on the foodblogs lately that one can eat kale raw in a salad, as long as you give it a good massage. I wonder if it will give me one back if I’m really good! And after a fantastic raw kale salad at one of my favourite restaurants (Camros Organic Eatery — Persian organic vegetarian food, go now!) last night before rehearsal for my latest show. I absolutely had to try it out myself. And I am SO glad I did! Paired with savoury Indian-inspired tamarind lentils (yummmmm) from Veganomicon, it was a filling, low-glycemic index dinner that hit the spot, ready in half an hour. Perfect for a Wednesday night. Toss kale, olive oil, and fleur de sel in a big bowl. Massage gently with your hands, which softens the kale and makes it less bitter. Allow the kale to rest for 10 minutes. Add lemon zest and juice, sumac, onion, and apple. Toss to coat everything well, and serve. Enjoy with a smug smile, because you’re getting your greens in deliciously!